Specializing in Death Records for Ancestors. Cemeteries, Death Certificates, Coffin Plates, Funeral Cards, Obituaries, Gravestones and more. The 10th Edition of Smile For The Camera is Costume so with that in mind I thought this photo might be appropriate. The photo is of the sisters of my Great Great Grandmother, Harriet Purdue. The girls were all milliners, that is to say they made hats for a living. They also were accomplished seamstresses and made their own clothing. 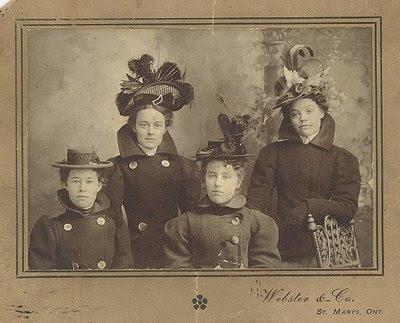 The photo was taken in St.Marys Ontario around 1895~1900. Fabulous!! I'll bet they really turned heads!It is more meaningful that you know a bit about the ladies in the photo. love the hats! Interesting how the one is smaller and less decorated. I love these. The one with the smaller hat seems to be a smaller girl ~ or is that because the others have on more cumbersome coats? I've seen websites in the past (don't know which ones) that offer classes in making hats such as these. Any takers?